Cagle and Bailey Adult Health located in Murray Kentucky focusing on a wide variety of family health services including preventative health, wellness, weight loss, chronic illness care, acute illness care, Bio-Inpedance Analysis, Heart Variability Testing and physicals. 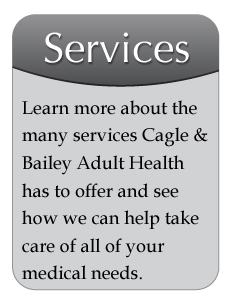 Cagle & Bailey Adult Health was started by Jennifer Cagle, NP and Karen Bailey, NP in 2007. Jennifer and Karen saw a need for a practice that was personal, compassionate, family friendly, and that catered to the patient. With over 30 years of experience in Family Medicine between them, Jennifer and Karen are focused on Preventative Healthcare, Wellness and Weight Loss, in addition to treating all forms of Acute and Chronic illnesses. They also provide various types of physicals including male, female, school, pre-employment, and DOT. When you join hands with Cagle and Bailey Adult Health, you will receive compassionate, affordable, professional care that makes you feel like you're part of the family. Call us today for an Appointment at 270-753-4616. Monday,Tuesday and Thursday – 8 a.m. to 6:30 p.m.
Wednesday and Friday – 8 a.m. to 4 p.m.